Farnoosh, G., Latifi, A., Khajeh, K., Aghamollaei, H., Najafi, A. (2015). Enzymatic Degradation of Organophosphate Compounds: Evaluation of High-level Production, Solubility and Stability. Journal of Applied Biotechnology Reports, 2(4), 339-344. Gholamreza Farnoosh; Ali Mohammad Latifi; Khosro Khajeh; Hossein Aghamollaei; Ali Najafi. "Enzymatic Degradation of Organophosphate Compounds: Evaluation of High-level Production, Solubility and Stability". 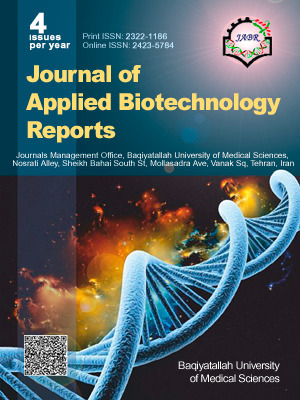 Journal of Applied Biotechnology Reports, 2, 4, 2015, 339-344. Farnoosh, G., Latifi, A., Khajeh, K., Aghamollaei, H., Najafi, A. (2015). 'Enzymatic Degradation of Organophosphate Compounds: Evaluation of High-level Production, Solubility and Stability', Journal of Applied Biotechnology Reports, 2(4), pp. 339-344. Farnoosh, G., Latifi, A., Khajeh, K., Aghamollaei, H., Najafi, A. Enzymatic Degradation of Organophosphate Compounds: Evaluation of High-level Production, Solubility and Stability. Journal of Applied Biotechnology Reports, 2015; 2(4): 339-344. The use of organophosphorus hydrolase (OPH) enzyme to degrade Chemical Warfare Agents is one of the most frequently used decontamination methods. OPH is a ~36 kDa homodimeric metalloprotein that is found in the membrane of Flavobacterium sp. strain ATCC 27551 and Brevundimonas diminuta MG and is capable of hydrolyzing a wide range of oxon and thion , such as paraoxon and parathion. OPH gene (opd) has been expressed in many hosts, such as bacteria, insect cells, fungi, and Streptomyces spp. High level and soluble expression and correct folding of each protein are of important factors. Fusion proteins, including TRX, Gb1 and MBP, are commonly used to increase solubility, folding and in some cases, stability. The present study evaluated thioredoxin (TRX) role in OPH expression level, solubility and stability by cloning the opd gene into pET32a and pET21a and expressing the resulting vectors in E. coli shuffle T7. The pET32a vector encodes a fusion protein containing TRX that is not present in the pET21a. The results revealed an increased expression level, solubility and stability in OPH produced by the pET32a-opd construct compared to the pET21a vector due to the presence of the TRX fusion in pET32a vector.